All right. I have to tread carefully here, so as not to give away too much of the play. In fact, I think I’ve said enough. Know that O’Toole/Tyrone are beyond brilliant and if you require a reason to see the play, well, here you are. 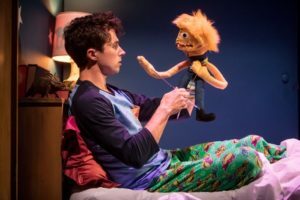 Hand To God is set in a church basement (and set designer Chelsea M. Warren has done wonderful work in creating a churchy ambiance). The play concerns the feeble efforts of the congregation, led by the earnest if not robustly intelligent Pastor Greg, a fab turn by Kris Nelson, who wears a wonderful series of dorky sweater-vests (major praise here to costume designer Sara Bahr), to put on a puppet show. The puppet show is being produced by Marge, who is entirely flummoxed by the recent death of her husband and the building insanity of her son (O’Toole again). Tracey Maloney plays Margery with heart-breakingly funny dignity. Lovely as always. Well, never mind what Jessica does. See Hand To God. Director Christina Baldwin reveals herself to be a highly astute handler of actors. The faster/funnier vibe works extremely well without interfering in any way with the detailed character work. Hand To God is imperfect. It’s sitcomy and it overuses deflating scene changes. Still, I had as good a time in the theater as I’ve had in a long long time and so, unless there has recently been a death in your family, will you.